SYSTEM SAVER CANINE was developed by a veterinarian to address some of the most common problems facing dogs (and cats) while also providing superior preventive protection. Before System Saver, there were limited options available for the treatment of inflammation and degenerative disease -- and each carried serious side-effects. At the same time it was apparent that all the "preventive" joint supplements were basically the same-they all contained glucosamine and chondroitin with various other nutrients and perhaps an anti-oxidant. They were not preventive at all ! They all provided nutrients to rebuild damaged tissue (cartilage) after the damage was done. Frustrated by this, and determined to find a better answer, a veterinarian began his research. He believed there had to be a natural solution without side-effects that would slow down the degenerative and inflammatory processes..At the same time, he wanted his formula to be a true preventive joint supplement-intervening before the damage occurs, not after. After a decade of careful research and testing, he developed an entirely natural supplement with none of the negative side effects of steroids, anti-inflammatories and immuno- suppressants. Moreover, he designed his supplement to carry that added benefit– it also worked as a preventative rather than just as a palliative. Clinical trials confirmed that System Saver delivered all he had hoped for-safely and effectively; it was time to make System Saver available to the public. System Saver Canine is an effective, safe, plant-based alternative to corticosteroids, non-steroidal anti-inflammatories, and immuno-suppressants. In addition, it is a totally unique and superior product for preventing tissue damage resulting from athletics, occupational injury and aging. When you combine these two actions (inhibiting pro-inflammatory enzymes, inhibiting tissue destructive enzymes) what results is one product that can address existing problems and prevent future ones. Over the past several years, countless people and animals have taken System Saver with beneficial, and often amazing results. Unlike traditional anti-inflammatory medications and corticosteroids, side effects such as gastric ulcers, vomiting, intestinal bleeding, colitis, immuno-suppression, and adrenal, kidney or liver problems have not been reported. Unlike nutraceuticals (chondroitin, glucosamine, hyaluronate), System Saver inhibits tissue destructive enzymes, rather than just providing nutrients for repairing the damage. How Do I Know If My Dog Needs System Saver? System Saver has been shown to restore and preserve the quality of life for countless dogs and other small animals. If your dog has arthritis, chronic respiratory disease, hip dysplasia, metabolic syndrome (Cushingoid), IBD, auto-immune disease, chronic dermatitis­ or is "showng his age", System Saver can help to improve his or her quality of life by successfully managing these issues. For active, healthy dogs System Saver provides a superior method to maintain (in addition to restoring) their soundness . System Saver helps to protect joints from damage before it occurs by : 1) inhibiting the enzymes that degrade cartilage & 2) inhibiting inflammation. This dual action is perfect for protecting the active animal from the effects of athletics, repetitive stress, aging and ‘overdoing it’. For a dog receiving rimadyl or other anti­inflammatories or steroids, SS provides a safe (side ­effect free) alternative to these medications. How Long Should My Dog Remain On System Saver? Since System Saver has not been associated with side effects, and since it protects your animal from tissue damage from a number of causes, continued use is only beneficial. System Saver has been shown over and over to restore and preserve the quality of life of animals (and their owners). Continued use provides continued benefits safely and effectively. What Do Customers Say About System Saver? She seems to have improved with her mobility. I expected great results because my friend and mentor Suzanne Clothier swears by the product and I have great trust in her judgement I will continue to use System Saver with any animals I have with any issues around inflammation. I will highly recommend this product to any friends and clients whose animals are experiencing discomfort/pain with chronic inflammation and degenerative conditions. Our dog Carson suffered from chronic seasonal allergic skin eruptions ever since we adopted him seven years ago, complete with bleeding hot spots and non-stop scratching, licking and biting of his skin. These episodes ultimately ended with trips to our vet for antibiotics and steroid shots at least twice each year in order to bring him any relief. When he suffered an ACL tear this past April, I found System Saver while searching online for alternatives to the TPLO surgery that our vet was recommending. However, as Carson's tear turned out to be total, we went ahead with the surgery and did not start him on System Saver right away, as our conservative surgeon was not familiar with it and discouraged us from giving it to him while he was recovering from the surgery. Instead, I forgot about it until he was seized by the worst episode of biting and scratching he'd ever had, once he was allowed to go outside for longer walks again. I gave Carson his first dose of System Saver in the desperate hope it might bring him some relief. His skin was red, as were his lips from the constant licking of his inflamed skin and he could not walk three steps without stopping to sit and scratch.? ?The results were nothing short of miraculous! Carson was able to sleep through the night without scratching and within three days, his skin was clearer and healthier than it had ever been before. He's feeling so much better in general these days, too! Needless to say, System Saver will be part of Carson's diet for the rest of his life. Thank you so much! In August 2009, Maddy, our beautiful, happy-go-lucky nine-year-old Soft Coated Wheaten Terrier, developed a rash on her stomach. I took her to many vets, and they kept prescribing antibiotics, which I could see were not working. The rash continued to get worse, so much so that it appeared to manifest as flesh-eating disease. Poor Maddy lived with this – in misery and confined to an Elizabethan collar -- for three months before a vet ordered a culture. The vet informed me that Maddy had MRSI and that I should “get rid of her.” Shocked, saddened, scared, and in no way willing to “get rid of her,” I was intent on finding a solution. I took Maddy to a canine determatologist. The news wasn’t good. Only one antibiotic gave her a small chance of survival. Although she did respond, there were no guarantees that the MRSI would not return. If it did, it was likely that it would not respond to any antibiotics, and we would lose her. A friend suggested that I speak with the folks who developed SystemSaver. I did, and that’s when Maddy turned around. She’s been on SystemSaver ever since. She’s happy, healthy, and most people think she’s a puppy. This fascinates me, because Maddy’s had a history of joint problems. Although she always loved to swim, she didn’t go in the pool at all in 2009, and she went in very rarely in 2008. I could see that she was in pain. Well, this summer, she’s been swimming many times! In fact, when I ask her if she wants to go for a swim, she dashes down the stairs and heads right for the door, eager to do a belly flop! As for the MRSI, it’s nowhere in sight, and no one has any worries that it will return. Thank you, SystemSaver! Your horse's health depends upon YOU and the care you give him or her. 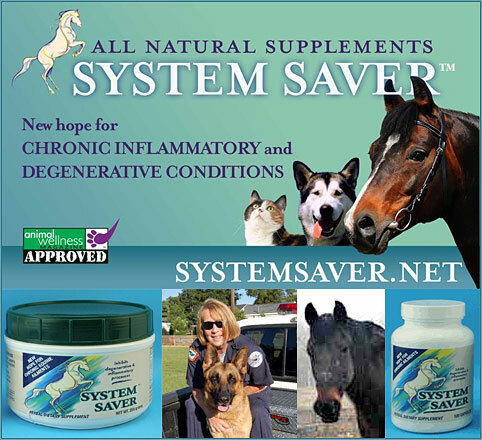 Make sure that System Saver is a part of your horse's health program. For more information about using System Saver for your horse, please contact us today.